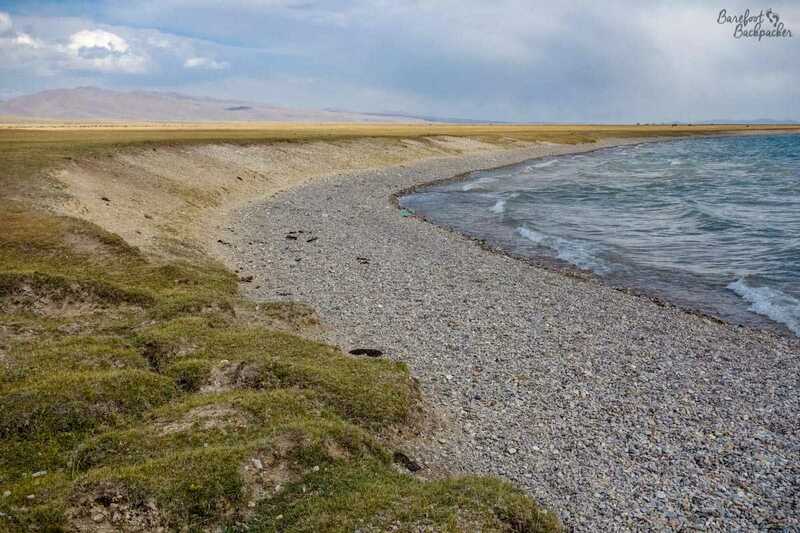 Song-Kol Lake, complete with stony beach. Yes I did throw stones into it, because I’m a big kid. It’s peaceful up here. The only sound is the lapping of the waves on the stony shore. The ponies in the distance are just milling around nibbling on the grass, and the yaks are mainly some way back down the road. The air is fresh, clear, and a little thinner than I’m used to – going for a walk at my pace leaves me a little out of breath after a few minutes – and the temperature hovering around 10ºC in the daylight makes a very nice relief from the mid-30s°C back in Bishkek. Yes, sometimes the Barefoot Backpacker wears closed shoes; I was even given a coat from one of the herders though I’m not feeling the cold that much yet. A rare pic of The Barefoot Backpacker, both for ‘wearing shoes’ shock, and for being a frontal view! I’m at a large mountain lake called ‘Song-Kol’, which translates from Kyrgyz as ‘following lake’, presumably in relation to it being the second largest lake in the country after Issyk-Kol. It lies at just over 3,000m, but the road on the way in travelled over a pass whose highest point was around 3,700m – this road was more like a gravel track that wound its way through the mountains like a tangled USB lead, past herds of yak, cold mountain streams where we could fill water bottles, and almost no human habitation once we passed a village near the bottom of the pass. The road up to Song-Kol through the mountains. Absolutely amazing drive, but definitely one to do in a 4×4! 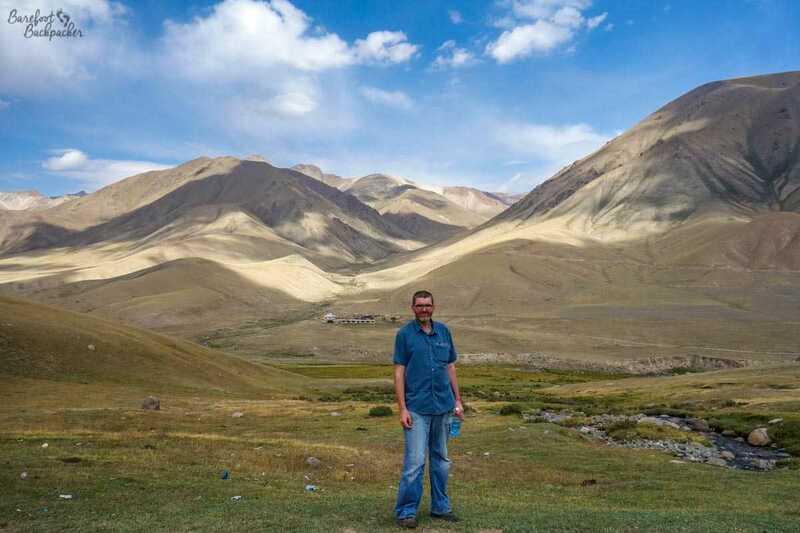 While on my trek into the mountains near Bishkek on Saturday, I got chatting to a couple of the locals in the group, and mentioned that I’d wanted to come up here; one of them told me that her (Natalia) and her daughter (Sashka) were planning on going later in the week, and did I want to join them? One thing I have noticed about Kyrgyzstan in general is that, while Russian and Kyrgyz are by far the most dominant and common languages, English is understood far more than I’d expected before I arrived, and many of the locals, especially the youth, are very keen on learning and practising it – they really seem to appreciate having a native speaker around. It’s coming towards the end of the ‘season’ here; in a month’s time the lake will be pretty much empty as the temperature drops and the road in becomes impassable – in the heights of Winter it will be upwards of -20°C and the lake will be completely frozen. 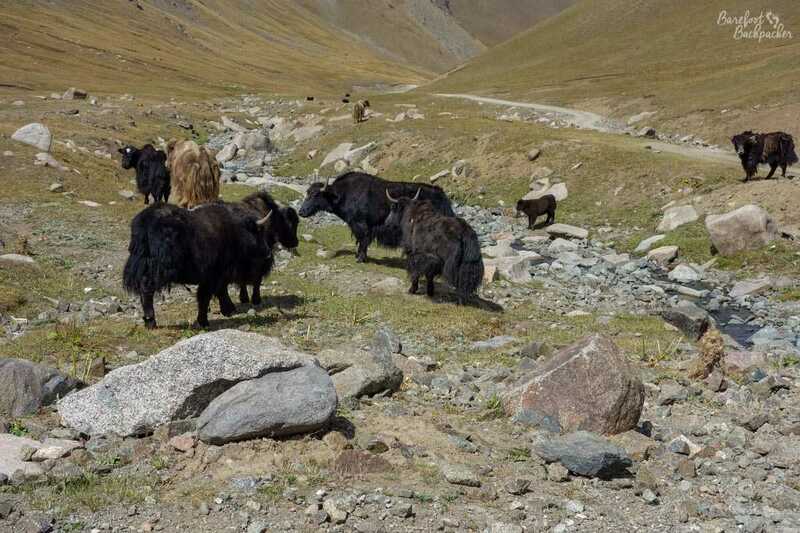 Even now, in mid-September, there are only a few hardy herders left; pretty much all the tourists have gone, fishing boats lie abandoned on the pebbly beach awaiting hibernation in the ice until next year, and the grassland is deserted apart from a handful of yurts – glints of dirty white on the green and grey landscape. 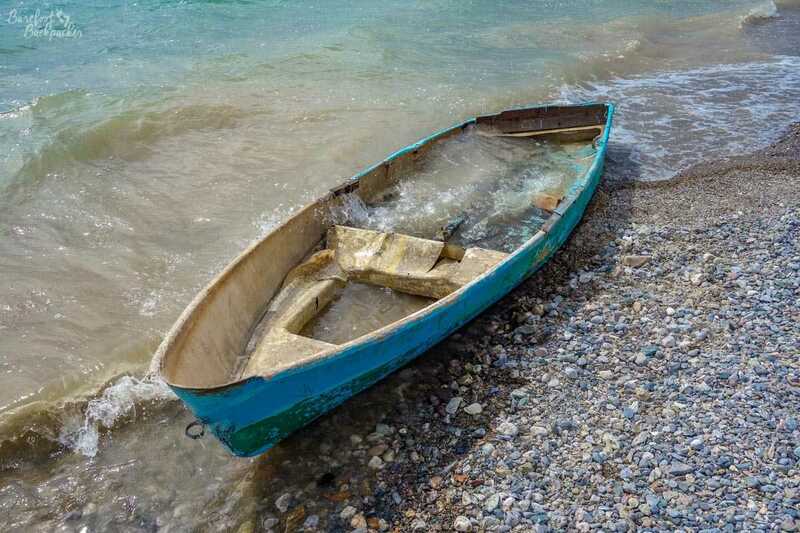 A fishing boat on the shore, abandoned, waiting to be swallowed by the water or destroyed by the Winter ice. A collection of yurts on the grassland by the shore – traditional and practical housing for the area, easy to build & dismantle, and very snug inside. Not that Song-Kol is set up for much tourism. There are almost no buildings here, never mind hotels or amenities; the only accommodations are the yurts – circular frames of wood covered in layers of linen, cloth, wool, whatever comes to hand. Pretty much everything you do takes place in your yurt – cooking, eating, sleeping – it’s a short walk to a shared outhouse for all things toiletry. 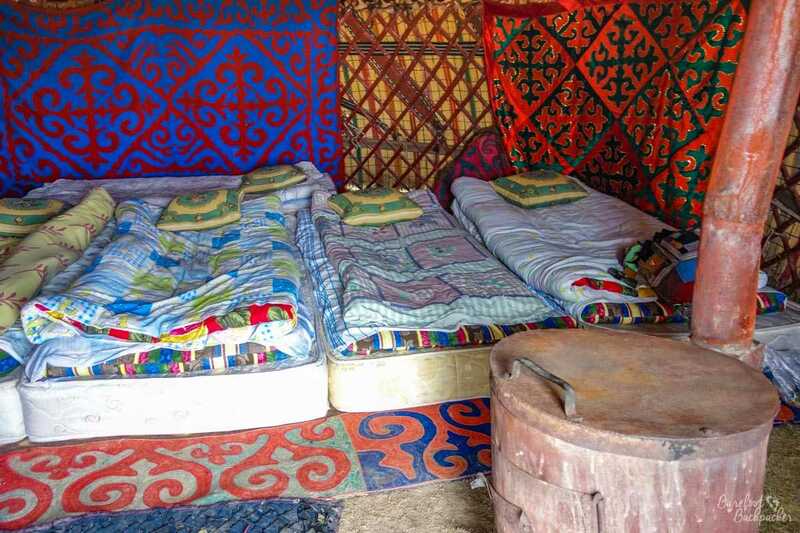 Bedding is simply a selection of mattresses laid out on the floor of the yurt, covered with a myriad of (usually very cheesy) sheets, bedding, and a mattress pad for added warmth. Our food is provided by the herders we’re camping with; they cook it on site and we eat pretty much all together in one of their yurts; it’s laid out on one of the mattresses. Sitting/kneeling on the floor to eat is a bit tricky if you’re not used to it; I’m never comfortable sitting cross-legged – yoga is not my cup of tea. Or slice of lemongrass, even. It’s a bit like a small buffet selection in the way it’s all laid out, and we can pick and choose which pots to delve into. 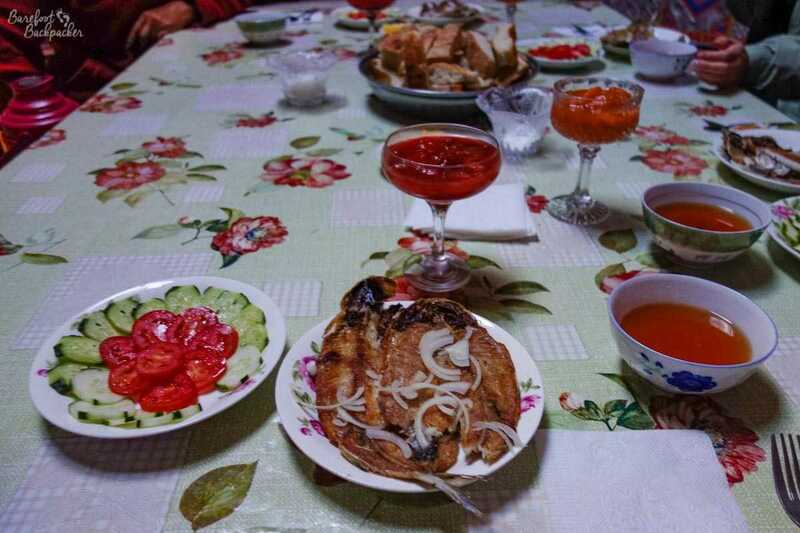 As you might expect, fish is a staple foodstuff up here – freshly caught from the lake of course. 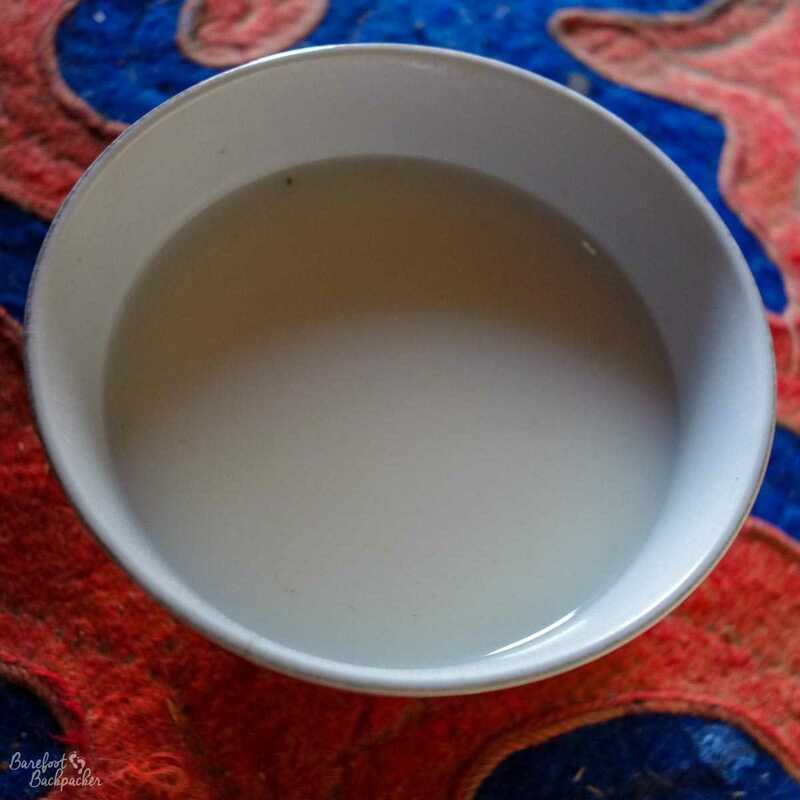 Salad, bread, pulses, and root vegetables are also quite common, along with a very milky and sour drink made from yak’s milk; kumis. Foul, foul stuff. But then I’m not a milk-drinker normally (chocolate milkshake excepted), so your mileage may vary. Related to this is a small, spherical, sweet made from yak’s milk with the density of Plutonium and probably the half-life to match. There are no shops of any kind, and apart from hiking in the mountains or hiring a horse from a local, there’s pretty much nothing to do other than stand on the lake edge and take in the view. My companions on the trip. To be fair though, it is a breath-taking (literally) vista; the lake stretches out to the horizon on one side, the mountains on the other shore are mere shadows, whilst on this side of the shore the flat grasslands soon give way to towering, foreboding mountains, bare grey/white rock stabbing the sky. There’s no snow on them yet, but it’s easy to imagine snow-covered peaks and blizzard conditions being commonplace here. Nightfall brings absolutely clear dark skies and it’s chilly but rewarding to spend a few minutes sitting outside the yurt looking at the stars – just as people have been doing here for thousands of years. The mountains, look so near yet seem so imposing and distant. 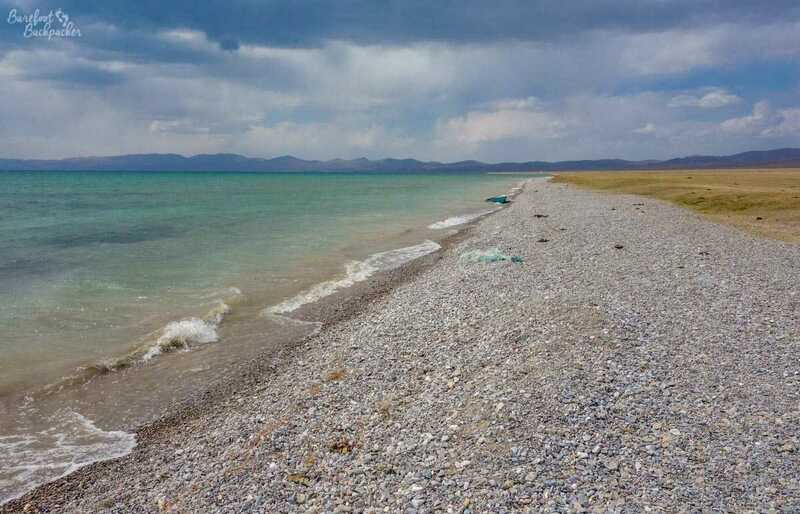 It’s a very serene and calming place; there is an underlying fear, however, that mass tourism will come, just as it has to Issyk-Kol, which has large impersonal hotels on the waterfront and becomes very crowded over summer. Of course Song-Kol has natural defences; it’s remote, there’s no real transport here, and the terrain available to build on is quite small, and this isolation is part of its charm, but still the underlying current is there – graffiti along the track on the way up the hill says, in English, ‘Save Song-kol Lake’, and the lure of the tourist dollar is often quite strong and difficult to ignore. On the way to Song-Kol, about an hour out of Bishkek, we stopped off for a short break at an ancient minaret just off the main road. 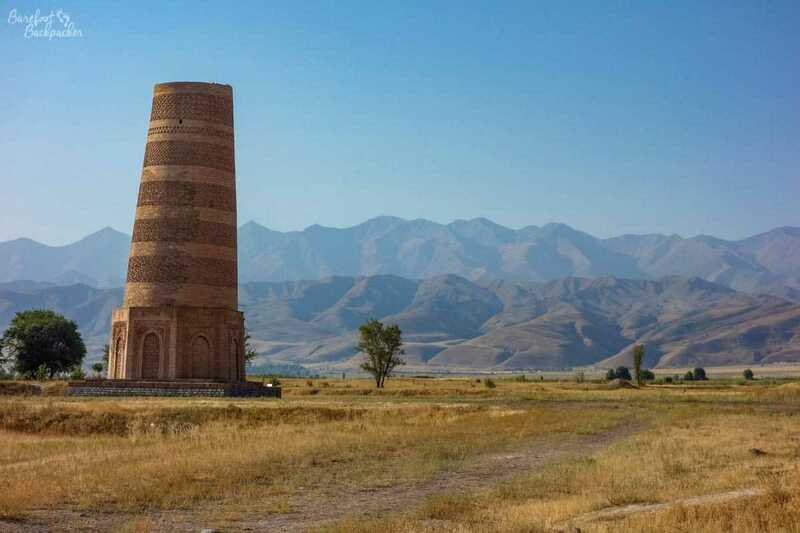 This was the Burana Tower, at first a seemingly odd and lonely structure with no obvious connection to anything else in the area. The tower, complete with setting. Must have been quite a dominant sight in mediaeval times. 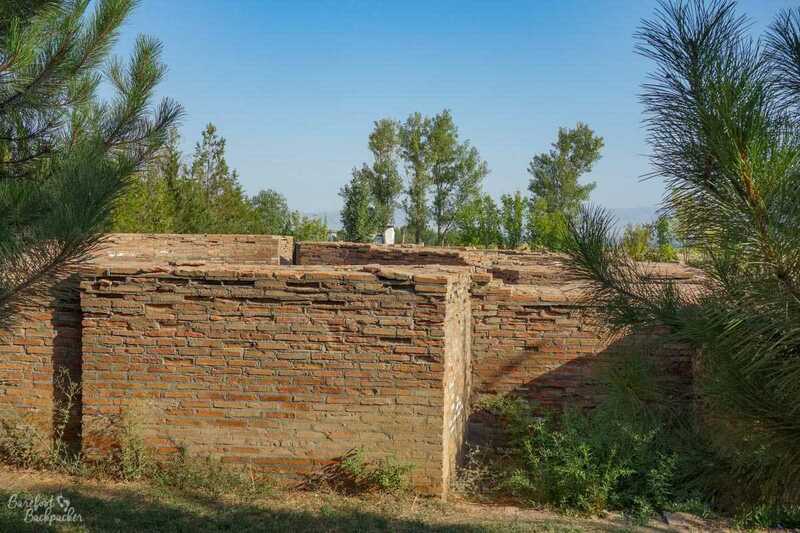 In fact, the tower was believed to have been built in the 11th century, on the site of an even older city called Balasagyn; the area has been inhabited for at least 2000 years, though after the Mongol invasion of the 1200s it seems to have been largely abandoned. The tribes of the area were generally Turkic peoples, descendants of whom form the majority of the population of most of the countries in the region. Pretty much all that remains of Balasagyn, I believe. Alternatively it could be just a random wall. It’s not exactly a tourist centre. The view from the top is apparently quite interesting, but on my visit it was closed. Near the tower was what, on first glance, appeared to be a huge graveyard, however on closer inspection the ‘graves’ turned out to be carvings of people in stone, often just an elongated face but sometimes a fully-formed and dressed figure. There were maybe a hundred of them, in structured lines, and each of them were different, uniquely carved and designed. Closer view of several stelae, in a variety of shapes and forms. It turned out these were what are called ‘balbals’, or, more properly, ‘Kurgan Stelae’. They were a traditional representation of people found most often around burial sites – not actual graves, nor depictions of real people who had passed, but more a kind of generic symbolic memorial to the dead. 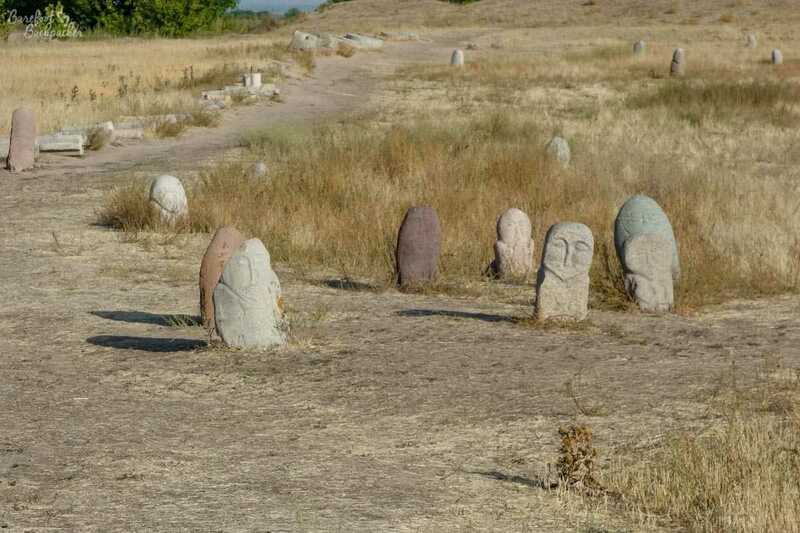 While it was uncertain when this particular site had been populated (although probably at the more recent end of the spectrum, possibly even related to the settlement at Balasagyn), such stelae have been found right across Central Asia from Turkey into China and have been dated as early as 6,000 years ago. 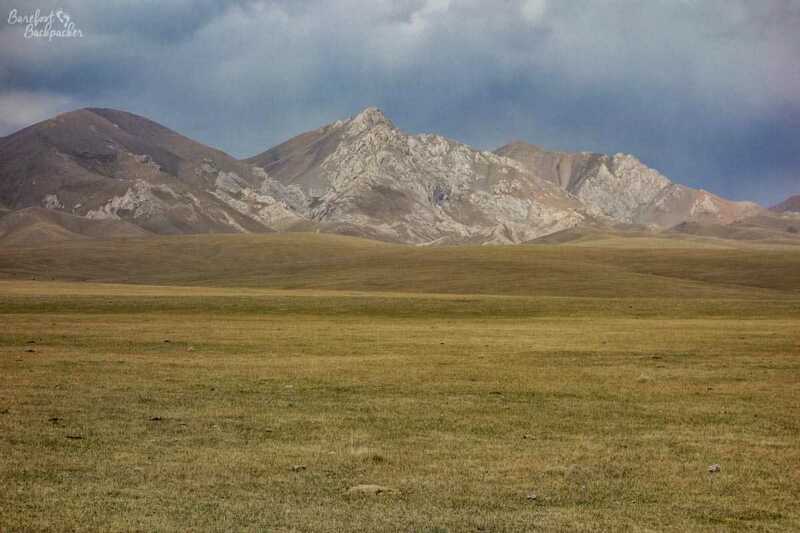 This is why Kyrgyzstan is such a worthwhile country to visit; there’s always something new to see, and the landscape never disappoints.